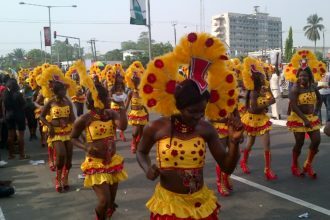 The peaceful city of Calabar came alive on Saturday May 2, 2015 as fans trooped to the Calabar Municipal Garden to attend the first concert of Star music Trek 2015. They witnessed dazzling performances from major acts like Chidinma, Wande coal, Cynthia Morgan, Black Magic, Oritse Femi and other Super Stars. The event, which was compered by popular Comedian Lafup, started on an exceptional note, and left the fans electrified to the very end in the small hours of the following morning. Black Magic was the first to mount the stage and the crowd didn’t stop cheering as he performed hit songs like Rainbow, Repete, Africa and Pass you by featuring Oritsefemi. Oritse Femi excited the audience with his soulful performance of his hit track Mercies Of The Lord that brought tears to his eyes. Chidinma Ekile came up next and she engaged her fans with a lot of energy. The petite singer was highly elated because it was her birthday and the audience sang a birthday song for her. She also announced that she was looking for a date to accompany her to her birthday party, which was after her performance. Another major highlight of the night was when Kcee the Limpopo hitmaker made a surprise appearance on stage at Calabar Star Music Trek and he wowed his fans with his performance of Pull Over, Turn by turn and Limpopo. He gave out 50,000 Naira to a fan that danced impressively. Wande coal then mesmerized the audience with the performance of his popular song Baby Hello. He also performed old songs likeBumper-To-Bumper; You Bad and he kept interchanging up his stagecraft with the help of his skillful backup dancers who choreographed the songs precisely. 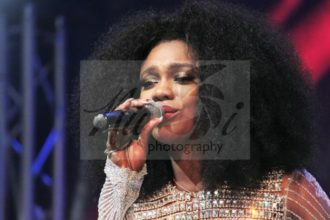 Burna Boy also did not disappoint the audience. The Reggae- dance hall singer got the audience wild during his performance. He performed popular songs like Don Gorgon, Like To Party, Gba Gbe and Check & Balance. Cynthia Morgan too engaged the audience with songs like ‘German Juice’, ‘Lead me on’, and popular hit ‘I’m Taken’. The next stop is Abakaliki on May 9, 2015. Don’t miss this.